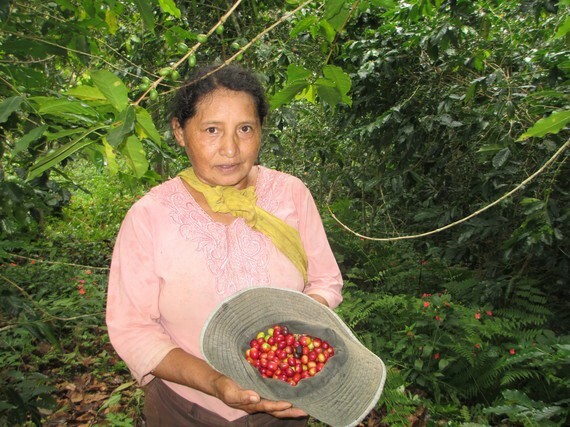 Tacana woman gathering shade-grown coffee within her indigenous territory in Bolivia. Photo ©WCS. I am a proud Scottish-American who grew up in Edinburgh celebrating our national poet by eating haggis on Burns night, and now I stand happily each year watching the fireworks to celebrate American independence from the British on July 4th. At the same time, I am haunted by the past behavior of my Scottish, Viking, and American ancestors: Raiding, pillaging, conquering, enslaving. The list is long, the suffering unforgivable. Have I continued in the footsteps of these forebears? Certainly not. While I am appalled by the sins of my historical “fathers” I recognize that I am in no way responsible or guilty for their acts. Am I acting differently because I am aware of them? I hope and believe so. I am also a proud conservationist at the Wildlife Conservation Society and celebrate every day an abiding love of nature. Established in 1895 as the New York Zoological Society (NYZS), WCS is one of the oldest international conservation NGOs, founded originally to address the precipitous decline of wildlife populations in North America. Fijian fishing community deciding how to manage their fishing grounds and protect the reef and their livelihoods. Photo ©WCS. Bison, Pribilof fur seals, passenger pigeons, beaver, and water fowl were all being driven to extinction — primarily as a result of the unregulated and unsustainable behavior of commercial hunters. By 1905 the tens of millions of bison that once roamed the western plains of the U.S. were reduced to 1644 individuals. As it happened, the slaughter of bison was a symptom of a larger problem of uncontrolled hunting. In 1907 the Alaska Central Railway and many mining companies were feeding their laborers by slaughtering unsustainable numbers of elk, deer, moose, caribou, and Dall sheep, and shipping any surplus to the lower 48 states for sale. 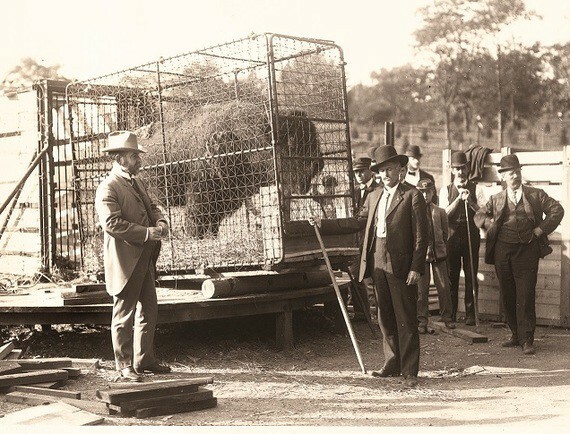 In 1907, the American Bison Society began the transfer of bison — reduced in the span of a few decades of indiscriminate hunting from some 30 million animals to scarely more than 1,500 — from the Bronx Zoo to protected lands in the American West. Photo ©WCS. To limit unregulated hunting, conservationists at the time (including those at NYZS) sought to protect species by creating national parks. Unfortunately, while Native Americans had hunted wildlife sustainably for generations and were not responsible for the collapse in wildlife populations in the US, their hunting would now be prohibited in these areas. At WCS today we believe strongly that wildlife and natural resources are most likely to be conserved and used sustainably when they are managed by the people whose well being depends on these resources. As we know today, the great bison kill-off was in part a deliberate effort by white settlers and the U.S. government to displace the tribes. Yet cruelly and contrarily, Native Americans were excluded from protected areas and prevented from hunting wildlife that they depended on for both their livelihoods and cultural identities. 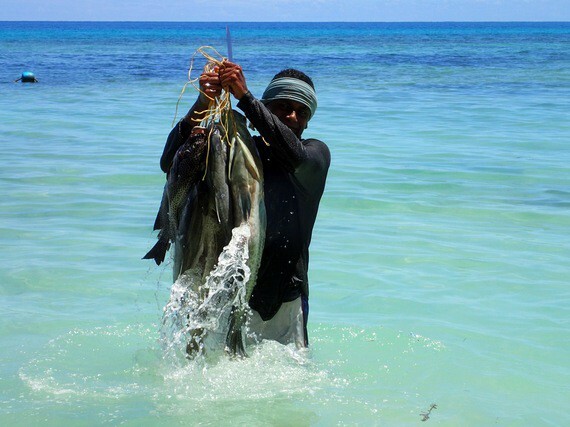 With WCS help fish abundance has recovered in locally managed marine areas. Photo ©Stacy Jupiter. That in the past, NYZS (which would become WCS in 1993) advocated for the physical and economic displacement of native peoples is both a historical truth and a philosophy and practice long since abandoned. It cannot be wished away, but neither does it in any way reflect the values of our current organization a century later. Today WCS works to save wildlife in some of the most intact and isolated places on earth. The indigenous, traditional and local peoples who live in these places are often isolated from markets, politically marginalized, among the last to receive social services, and some of the poorest and most vulnerable people on the planet — a true bottom billion. WCS trained para-veterinarian providing livestock health services to indigenous families in Bolivia. Photo ©WCS. That they depend on the sustainable use of natural resources for their survival and sense of self makes local people vital partners and vocal constituents for conservation. At WCS today we believe strongly that wildlife and natural resources are most likely to be conserved and used sustainably when they are managed by the people whose well being depends on these resources. Given that conviction, WCS strives to secure formal rights for local people who have legitimate claims over the land, waters, and resources they have managed for generations. With WCS help Tacana men learned how to capture Paiche. By fishing this invasive species the Tacana are generating income for their families and protecting native species of fish within their indigenous territory. Photo ©WCS. We help local resource rights holders to build the governance capacity they need to control who has access to their resources and to regulate resource uses so that they are sustainable. To ensure that local people do not unjustly shoulder the costs of conserving global public goods, we look for both market based (e.g., sustainable natural-resource-based enterprises) and non-market based (e.g., livestock insurance, education scholarships) incentives to encourage conservation. Challenges to conservation and approaches to protecting our planet’s biological resources have changed in the last 120 years. Conservation organizations like WCS are staffed by individuals that embrace the diversity of cultures on our planet and who do not see local people as a problem but rather as allies whose rights must be secured, not taken. With support from WCS Kabu Tours is protecting endangered turtles and generating income for poor coastal families in Pearl Lagoon, Nicaragua. Photo ©WCS. Across the globe, we partner with indigenous and local peoples to help them to achieve their vision for a more secure future in which wildlife remain a visible and culturally valued part of the wild places where they live. My father who died recently at the age of 95 was a good and kind man. He taught me that the past should not define us, but we must learn from it if we are to make better decisions than our ancestors. This article was originally published at Huffington Post on February 1, 2016.